Kansas City, Mo. — On Saturday, July 21, Invicta Fighting Championships hosted Invicta FC 30: Frey vs. Grusander from the Scottish Rite Temple in Kansas City, Mo. The event streamed live and exclusively on UFC Fight Pass beginning at 8 p.m. ET. The Invicta atomweight belt now belongs to Jinh Yu Frey, as she edged Finland’s Minna Grusander by decision after five grueling rounds. Grusander was heavy in the clinch throughout the fight, pinning Frey to the fence. Frey countered with knees to the body to separate. Grusander worked hard for multiple takedowns against the fence, looking for an armbar late in the opening stanza. Frey utilized her own wrestling attack, earning takedowns in the middle rounds. In the third round, Frey was the most effective, threatening with a rear-naked choke. Grusander rebounded with slicing elbows in the fourth, negating another takedown from Frey. The fifth and final stanza saw both fighters dig deep, but neither could find the finish. The judges had their work cut out for them, but handed down a unanimous decision win for Frey. The undefeated record of featherweight Felicia Spencer remains intact after she submitted Ukrainian Helena Kolesnyk in the second round. Spencer used her taekwondo background to fire off a variety of kicks, but Kolesnyk was able to avoid damage and fire punches. Spencer scored with a trip takedown and quickly took the back of Kolesnyk along the cage. She worked for a choke, but could not secure it. In round two, it was more of the same, as Spencer was able to gain a dominant position on the mat. When Kolesnyk rolled to her stomach, Spencer sunk in the fight-finishing rear-naked choke and coerced the tap. 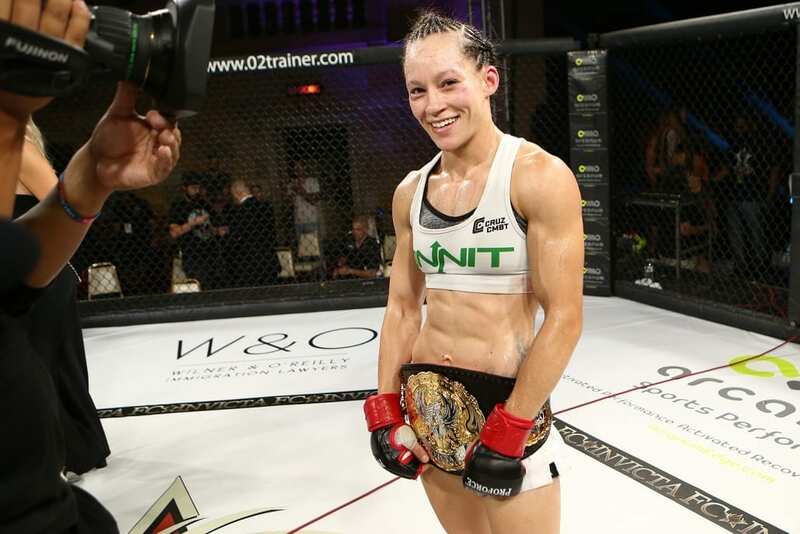 Veteran Heather Jo Clark successfully debuted in the Invicta cage, outworking Brazilian Kinberly Novaes over the course of three rounds. Clark came out firing, landing a right straight and spinning backfist. Novaes clinched and the fight stalled along the fence. The pair traded knees from the inside for the majority of the opening frame. In round two, Clark powered into a blast double-leg takedown and scored with heavy shots from the top. Down on the scorecards entering the final frame, Novaes came forward with a purpose in the final round. Clark looked for a takedown, but Novaes sprawled and was able to takes Clark’s back as time expired. It was too little, too late for Novaes, as Clark claimed the decision nod. In a battle of unbeaten flyweights, Guam’s Brogan Walker-Sanchez put an end to Miranda Maverick’s unblemished record. Walker-Sanchez was quick to close the distance, but it was Maverick who looked to take the fight to the canvas. She did so late in round one, finishing the round on top. Maverick again looked to grapple in round two, as the pair traded leg lock attempts. Walker-Sanchez used the 50-50 position to get to top position and then move to Maverick’s back. Round three featured a lot of single punches from each fighter, but a late single-leg attempt from Maverick ended with Walker-Sanchez in side control. When the scorecards were read, it was Walker-Sanchez who took home the decision. 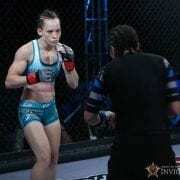 Stepping in on short notice, Stephanie Geltmacher made short work of bantamweight Kerri Kenneson in the first round. Geltmacher used her wrestling to put Kenneson on her back immediately. She passed to mount and began to unleash an assault of punches and elbows. Kenneson held on as long as she could, but after dozens of unanswered strikes, the referee stepped in to halt the contest. Alesha Zappitella quickly put a stamp on the 105-pound division, handing Jillian DeCoursey her first career defeat. Zappitella was aggressive coming forward, scoring with flurries that backed DeCoursey against the fence. She rocked DeCoursey a number of times with her overhand right. Zappitella was also able to utilize her wrestling pedigree, neutralizing the ground game of DeCoursey from inside the half guard. DeCoursey showcased her toughness, absorbing the heavy shots from Zappitella and smiling in response. But it was Zappitella’s constant offense that allowed her to sweep the judges’ scorecards. Atomweight Alyse Anderson returned to the win column with a highlight-reel finish of Stephanie Alba. The pair exchanged on the feet before Anderson initiated the clinch and earned a takedown. She was able to pass to mount, forcing Alba to give up her back. Anderson looked for rear-naked choke, but the round expired. In the second frame, Anderson again clinched and looked for a takedown. Alba was able to return to the feet and put Anderson against the fence, but Anderson went for a flying triangle. The choke was deep and eventually put Alba out cold. The night’s action kicked off with a battle of debuting flyweights as Erin Blanchfield took on Brittney Cloudy. Cloudy’s jab was her primary weapon in the first round, as kept Blanchfield at range. A right hand from Cloudy wobbled Blanchfield midway through the frame. Round two saw Blanchfield fire back, scoring with a slapping head kick and earning a takedown. She looked for an armbar, but Cloudy would survived the stanza. The final round largely took place on the feet, but a late takedown from Blanchfield was enough to sway two of the judges to award her the decision victory. This was my first time watching Invicta, and it will be my last. I have been a fight fan since the 70s, watching ABC Wide World of Sports and the top boxers of that era fight on television. The final championship fight on this card was stolen from the Finnish fighter. She had won three of the first four rounds, so unless there was a stoppage in the fifth round, she would win the belt. There was no stoppage, but somehow, Frey won a unanimous decision? Invicta has only been around since 2012 and they are already fixing fights? That really is too bad, because up until that point on the card, it was very entertaining. There are some very talented female fighters out there, but if you are just going to give belts to who you think should have them, well, you have lost a viewer after viewing my first card. It’s unfortunate that you have these conspiracy theories. Invicta FC events are sanctioned, officiated and judged by ABC commissions. The promotion has no say in how the fights are judged or who comes out as the winner. I would encourage you to do some research on this topic before writing off the promotion for something that is beyond its control.